Black Eyed Susan always reminds me of my childhood. My parents always had it growing in the garden, and still do! This photo was taken in my Moms front yard. It is one of my favorites too. Reminds me of sunshine. I like how you captured this. Beautiful golden colors and sunshine! Visiting from FF. Same, here, from my earlier days in Vermont. They're beautiful flowers. I'd seen them many times, but only heard the name for them over the past summer. One of my favorite flowers since they grow everywhere. Lovely image!...as usual! Happy Friday. 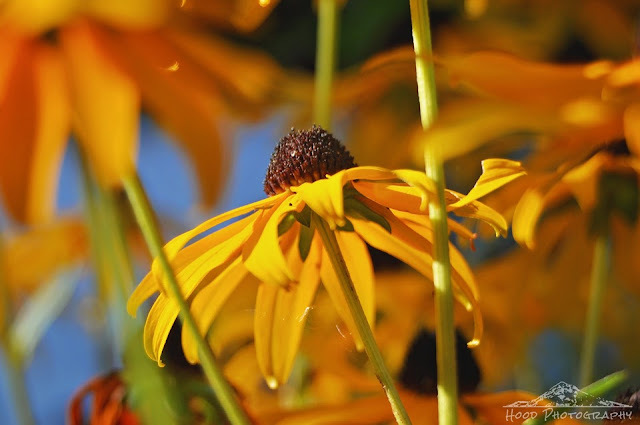 Wonderful capture oft the Coneflower. Beautiful light as well. One of my favourites in the garden. Have a lovely weekend. Love the golden color of this, my son lives in Wilsonville and I am going toward the end of Oct. It sounds like fall is coming early this year. I was hoping it wouldn't but I will have to take what I can get when I am there. Such a beautiful state. Lovely photo, Susans look so cheerful and sunny, I tried growing some Rudbeckia one year but was discouraged when most did not repeat the next year, except for one tall mysterious one.